Hi there. Well, I'm very lucky this year to have a couple of Orioles. Beautiful bird, and as you can see the pictures, the male is very comfortable enjoying the orange. The female prefers to have a Sunrise bath in our Cherry tree. Beside the Oriole I have dozens of wild birds like Blue Jays, Cardinals, House Sparrows, White Throated Sparrows, White Crowned Sparrows, Red Winged Blackbirds, Robins, Chickadees, Goldfinches, House Finches, Purple Finches, Green Finches, Mourning Doves and more. Thank you so much for your report and for your beautiful pictures, you are fortunate to have such abundant wildlife in your yard - thank you for sharing your information with us! 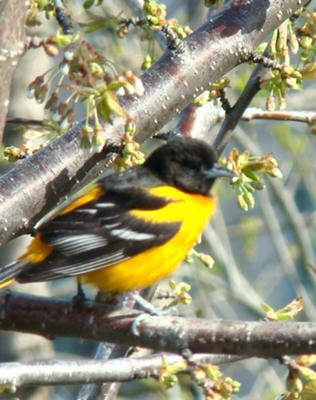 Spotted my first Baltimore Oriole in my backyard yesterday and again today. The beautifully coloured orange male seems to be attracted by my Trumpet Vine flowers, which is also orange. The hummingbirds like it as well, so maybe they like the same food source. So pleased to have this bird visit my garden, I hope it doesn't have to fly off too soon! We have had a pair of Orioles at our Hummingbird feeder in Burlington Ontario for three years now. I subsequently took out a couple of the inserts - the yellow part of the Hummingbird feeder - so the Orioles can get at the sugar water more easily. This year 2 pairs arrived in May. As I write this message on August 14, the families are busy at the feeders competing with the Hummingbirds. I believe they are preparing for the flight south by loading up on the sugar water. In fact, one web site I read recently indicated that the latest Orioles begin their migration from Ontario is August 15. We will miss them but will be prepared for several families next May. As a follow up to my earlier posting above, not only have the Orioles not departed as expected, they have been joined by 2 more! We now have 6 young Orioles feeding at the Hummingbird feeder and enjoying orange slices. I hope we are not doing them a disservice by keeping them around! It's terrific entertainment. We are in the Canborough, Ontario area and have had Baltimore Orioles here at our feeders for years, and not just one pair, many of them. 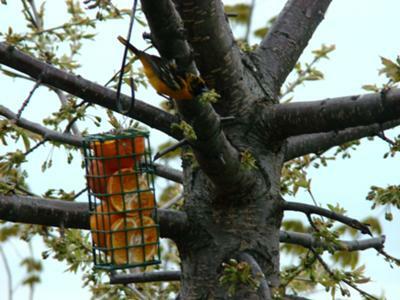 We use the special Oriole feeders from Home Hardware and always make our own syrup for them. Pour 400 ml boiling water on 200 ml sugar, stir until dissolved. Then add another 500 ml cold water with 5 drops of red food coloring and 8 drops of yellow. Clean the feeders at least once a week and make new syrup. The Orioles and Hummingbirds take turns drinking from the same feeders, they love it and come back all day for more. They come in May, staying all summer until the middle of September. They have been in our yard since the first week of May ..... Waterdown, Ontario, near Burlington. Used orange liquid mixture feeder that is sold at Canadian Tire stores, early May for two weeks. After that they stopped showing up. Orioles head back south in July. 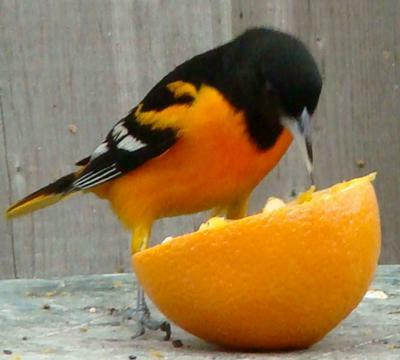 Orioles likes pears as well. I made for them syrup and they enjoyed a lot. Now for a few days I don't see them anymore and I will like to know why. Still fresh oranges and fresh syrup are waiting for them under the Cherry tree. I JUST saw one in my backyard by my pond this morning (May 20th, 2011) and I've never seen one here before. Unfortunately I'm out of oranges, so I'm off to the grocery store to see if he'll come back again tomorrow!? !